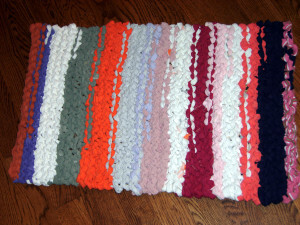 Traditional rag rugs are made with scraps of old material, usually old clothes and household linens. 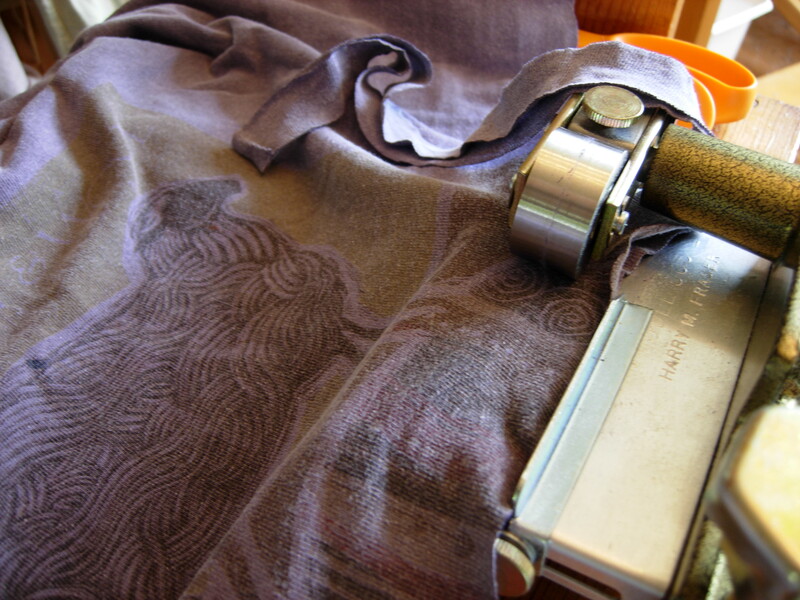 The scraps are almost always woven fabric, which is more stable than knitwear. I have developed a technique to use t-shirts, which are made from stretchy knitted fabric, to make beautiful rag rugs that are just as sturdy as their traditional counterparts. Occasionally these are available to purchase at my Etsy store, Armanda’s Handwoven Creations, or contact me to have a memory rug made especially for you with your own special t-shirt collection. For example, you could have a rug made from all of your daughter’s baby clothes or your son’s baseball shirts from each season, or the t-shirts from ten years of beach vacations. I am an avid recycler. So, when I saw the description in Mason-Dixon Knitting by Kay Gardiner and Ann Shayne (2006, Potter Craft) of t-shirt calamari knitting, I had to try it. Old t-shirts are cut across the body into loops (this is the calamari! ), which are joined together by slipknotting them one after the other until you have a long chain of loops. This is your ‘yarn’, and it can be knitted with as described in the book, on VERY large needles, to make something rug-like. I know, because I tried. I wasn’t a weaver yet, so I got my size 35 needles and knitted a rectangular object in garter stitch. Knitted t-shirt rug, carefully pressed into shape for the photo! The problem was that knitting is stretchy. It is supposed to be stretchy; that is, in fact, its utility in the world of textiles. It is ideal for socks and hats and gloves and pullover tops. It does not, however, make a very stable fabric for a rug. My rug usually looked like a pile of wet towels someone dumped on the floor when they came in from the pool. So I put the ‘rug’ under the cat’s litter box in the basement and put away my basketball-size roll of t-shirt chains and moved on to other things. As it happens, one of those other things was weaving. And, eventually, weaving rag rugs. I had a long rug warp on and needed to weave it off. In my search for old sheets and clothes in the basement, I came across the archived t-shirt yarn. Hmmmm. Cutting t-shirts with a Fraser Rag Cutter. It worked pretty well as rug weft, although I had cut it too thick for rug weaving. It also came out a bit too loose, probably due to the elasticity of the bunched t-shirt weft. Still, it had promise. So I made another ball of t-shirt yarn specifically for weaving. I cut thinner strips, so that as they lay doubled in the shed they would be about the traditional pencil-size roll of weft. I pulled each loop tightly so that the knots were as small as possible and the elasticity disappeared as the raw stockinette edges curled in on themselves and were hidden. This is key because, in addition to the loose weave problem, using an elastic weft can cause problems with uneven selvedges and draw-in. 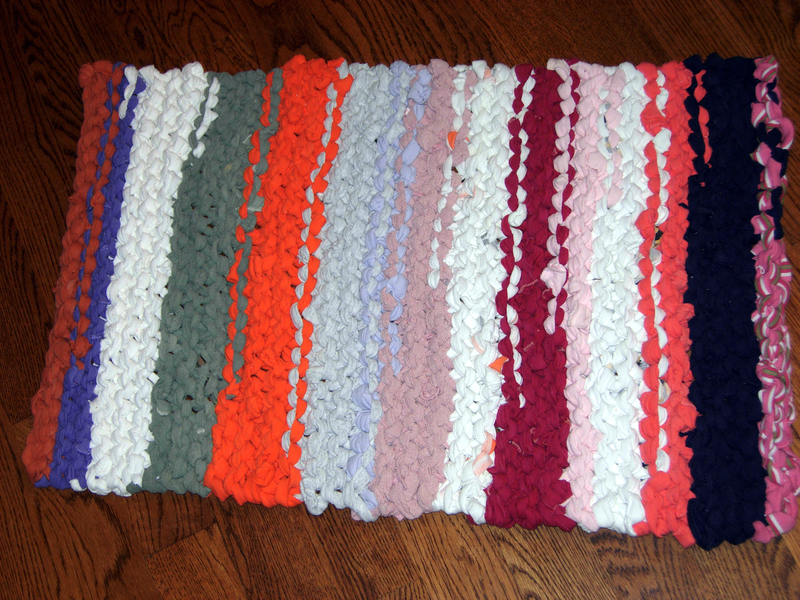 The result is a stable rag rug with great structure, an interesting texture from the knots, and it uses materials that are widely available, inexpensive and come in any color in the spectrum. 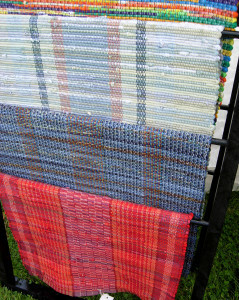 Tom Knisely included my t-shirt rugs in his new book, Weaving Rag Rugs (Stackpole Press, 2014). Your guild or weaving school can host a two-day T-shirt Rug Workshop. Bring that pile of ratty old t-shirts and at the end of the workshop you’ll have a couple of gorgeous rugs instead — and the knowledge you need to go home and make more!